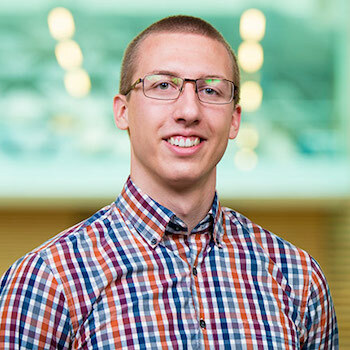 Fisher is a PhD candidate in Management at the Lazaridis School of Business and Economics, concentrating on Organizational Behaviour and Human Resource Management. This year, the Human Resources Research Institute (HRRI) named the master’s project he completed for his MSc in Management the best in Canada. This marks the fourth time since 2011 that a Laurier student has won the HRRI Best Master's Thesis award. For his project, completed under Professor Chet Robie, who is still his supervisor now, Fisher found that all-male teams displayed on websites resulted in an advantage for certain male job candidates. Fisher first became involved in researching gender in the workplace when he worked with Assistant Professor Ivona Hideg as a senior undergraduate student, also at Laurier. Hideg remains a mentor and an important influence, says Fisher. There is a phenomenon, well established in academic literature, known as stereotype threat, whereby people exposed to negative stereotypes about the group they belong to perform worse than people not exposed to these stereotypes. A related phenomenon is stereotype lift, which occurs when people exposed to negative stereotypes about other groups perform better. Contrary to his hypothesis, Fisher did not find that women exposed to all-male “our team” pages performed worse. However, he found that some men exposed to all-male teams performed better – giving them an advantage over women in a probable example of stereotype lift. Fisher set up his experiment by using the website of a friend’s startup, changing its name and details and altering the “our team” page using fake names and stock photos. The company was billed as a finance startup, a male-dominated field familiar to students of the Lazaridis School. Research participants were randomly selected to see a website featuring an all-male team, an all-female team, or no team page at all. At first glance, Fisher didn’t see a gender-based performance differential. But when he looked at the self-monitoring scores, he found some surprising results. People have different levels of skills at self-monitoring – that is, picking up on social cues and adjusting behaviour to fit different situations. People with a high degree of skill at self-monitoring have been shown to be more successful in their careers. Men who had high self-monitoring skills did “much better” in the cognitive ability tests when shown an all-male team, says Fisher. However, there was no difference in performance when they saw an all-female team or no team. Women participants who had high self-monitoring skills did better when shown an all-female team page but did not perform better than their male counterparts. There was no significant difference in their performance when they were shown an all-male team or no team. Among those with low self-monitoring scores, neither male nor female participants showed significant performance differences regardless of what team, if any, they saw. Fisher hypothesizes that this was because these participants were less likely to pick up on the team composition. Does this research mean that to achieve a better gender balance, companies should eliminate “our team” pages? Fisher says it’s too soon to make a definitive recommendation. He’s now planning to experiment with different team compositions to take his research further. However, “STEM startups need to recognize that there could be negative effects from something as innocuous as putting your team on your website,” Fisher says. “In tech culture, people aren’t very conscious that gender inequity exists. If even one tech startup looks at themselves and says, ‘Maybe we need to change the way we recruit people,’ then that’s a good thing." Previous Laurier winners of the HRRI best master’s thesis award are: Su Kyung (Irene) Kim (2015), Annika Hillebrandt (2013) and David Whiteside (2011).